“I knew that once again I was gonna lose good friendships when we left Hawaii. The one big thing that constantly undermines this sail-boat travelling thing is that we meet so many like minded friends who live their lives on their own boats, be it other sailors, fishermen or just locals with a love of the sea. And then we move on; continuing our voyage eastwards, following some dream that sometimes we’re not so sure about anymore. My friendship with Sergio and Eric in Hawaii was just this. Sure, we’ll stay in touch for a while as always, but then things fade away as we all continue on with our lives. Each and every time it becomes more difficult to cope with.” Dave. We both knew we were in for another hard time with yet another tough ocean crossing confronting us. Because of the Pacific hurricane season and US Customs time limit restrictions, we had a weather window of May and June to leave Hawaii for Canada… a voyage of nearly three thousand miles once we’d made our roundabout route around the static North Pacific High that sits between Hawaii and the north-west coast of America. Things were made even harder with Lauren’s first child being due in May back in England. But with the harbourmaster in Ala Wai Boat Harbour informing us that we had to leave by the end of April we had little choice. We’d been in Hawaii since arriving on the Big Island from Bora Bora in French Polynesia the previous July. The Hawaiian islands are not an easy place for a foreign sailing boat due to a lack of harbour space and sometimes appalling anchorages as far as shelter is concerned. And the relentless easterly trade winds whip up between the islands, funnelled by huge volcanoes which create big, dangerous seas that are a constant hazard when island hopping westwards. No one relishes returning eastwards. But, of course, it would be wrong for us to complain. Hawaii is a true dream! Constant warm temperatures… never too warm or too cold, make these islands idealic to lose time. The previous summer we’d island hopped with Henry joyously onboard, from the big island of Hawaii – taking in Hilo, Kona and Honokohau, to the islands of Maui, Molokai and Oahu and eventually to Honolulu. We then found an incredible location in Ala Wai Small Boat Harbour where, we were informed, we could moor Sänna for a maximum of a hundred and twenty days in each calendar year, but our end of December deadline coincided with a new period beginning this last January, which ran all the way until the end of April this year. It was ideal, not only did it solve the problem of a safe mooring location but it was right in the centre of Honolulu… and immediately next to Waikiki Beach… for only eleven bucks a night! The real boon though was that we shared our gated finger pontoon with Sergio and his marvellous forty five year old sloop Impulse. 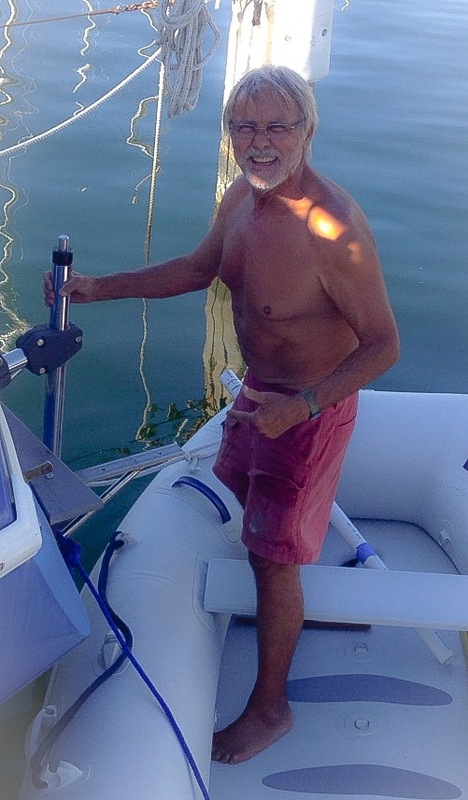 You’ll know from our blogs that seventy year old Sergio intended selling his Italian restaurant in Honolulu, so that he could sail his beloved Impulse back to Italy and the Mediterranean. Through Sergio we met the irreplaceable crazy surfer Eric and his wife Claudia living aboard Maluhia and we became good friends. Dream days! 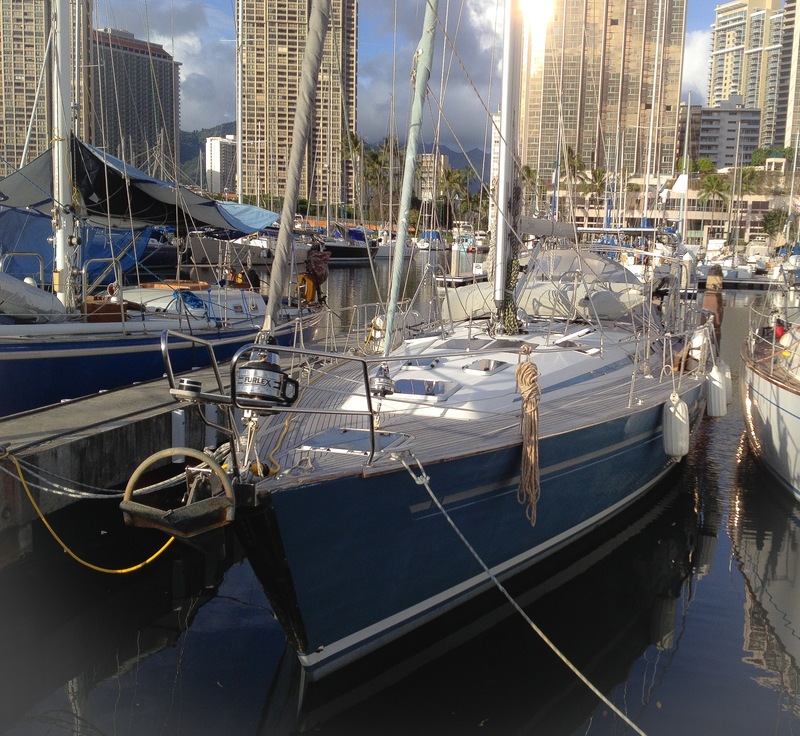 Gary Cole arrived from England in April to help sail Sänna from Ala Wai Harbour and, of course, for a well deserved three week Hawaiian holiday. Our very good friend Sarah also arrived from England in May; Sarah helped us sail Sänna from Oahu to the island of Kauai, from where we ourselves would eventually depart Hawaii for British Columbia in Canada. We really valued our wonderful time with Sarah. 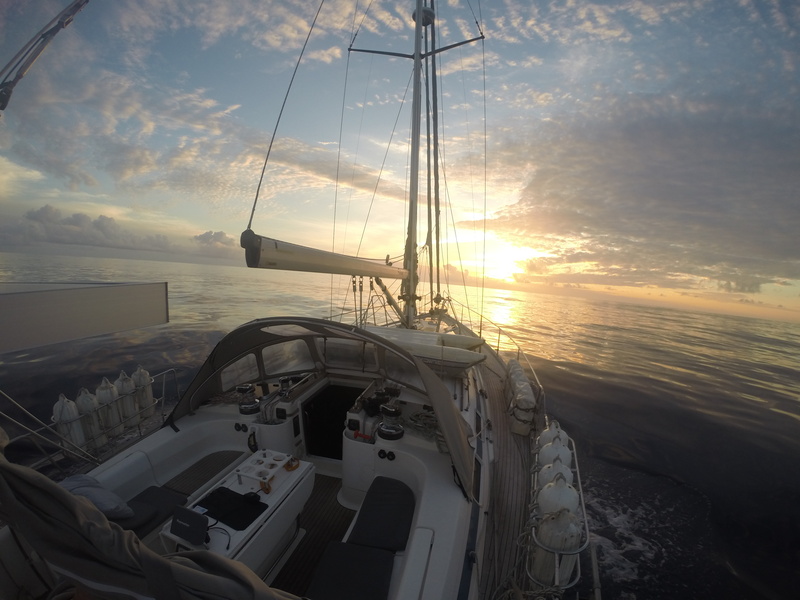 Hawaii to British Columbia – Ocean Crossing. 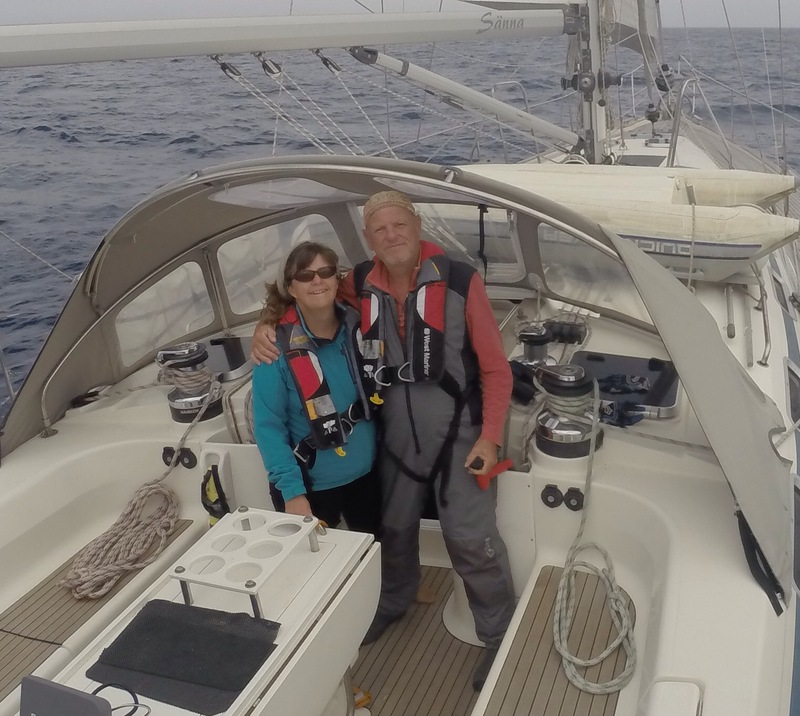 Of course, weather conditions gradually changed; first came cooler winds, then the rain and, finally, intermittent fog… we knew we were entering a far different weather regime which deteriorated the further north we sailed. Leighton & Lynda, who we’d made good friends with in Hannalei Bay, were about a day behind us sailing their American flagged ketch Morning Star and we kept in touch over our SSB radio. We also received weather reports from their friend Skip based in San Fransisco. It was Skip who warned us of the bad storm heading relentlessly our way although we’d also picked it up from our own weather report downloads. Unfortunately, it didn’t look good and so things proved. Well, we survived… just. Our terrifying experience and eventual knockdown by a huge rogue wave has recently been documented in the article entitled ‘Too Many Eggs and No Toblerone’, published by the UK’s Yachting Monthly magazine. Morning Star managed to avoid the storm but we ourselves couldn’t get out of its way. Originally, we were heading for Victoria, our destination at the southern end of Canada’s Victoria Island; but the storm forced us to run a long way north under bare poles and Sänna was blown over three hundred miles northwards from our intended course. Cold and exhausted, we eventually made landfall in Prince Rupert just south of the Alaskan border with British Columbia. But, do you know, Prince Rupert is really nice. The first thing we realised is that British Columbia is another world when compared to both the South Pacific and Hawaii. Snow topped mountains, vast pine forests and incredible wildlife that includes huge numbers of humpback whales, orcas, grizzly bears and bald eagles make British Columbia and Alaska a wilderness paradise. But first we had to contend with awful Canadian Customs & Immigration who refused to stamp Dave’s passport because the pages were just about full. Where were we supposed to go? In the end, after much arguing, things were resolved but it was an auspicious start. Surely the surly woman could see we were cold, exhausted and needed rest after battling our way into Prince Rupert harbour? But no… authority sometimes breeds such little people. Of course, we shouldn’t complain. British Columbia proved to be friendly and so different. Eventually we made our way around to Port Edward, a working fishing port which had much more berthing space than Prince Rupert… a real problem for any foreign sailing vessel arriving there from offshore. 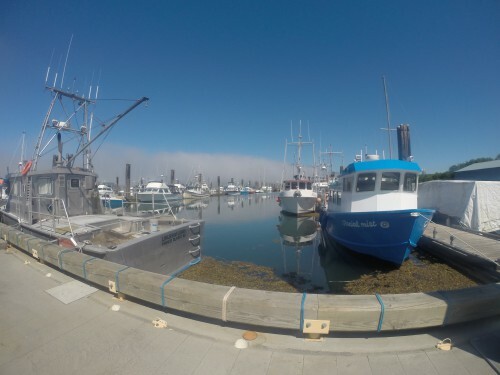 Port Edward is magical and we soon made friends with Harold & Raina, Paul and Ted, Big Jim and Fred… all local fishermen who made us really welcome and told us why we couldn’t catch salmon and halibut – however much we tried. 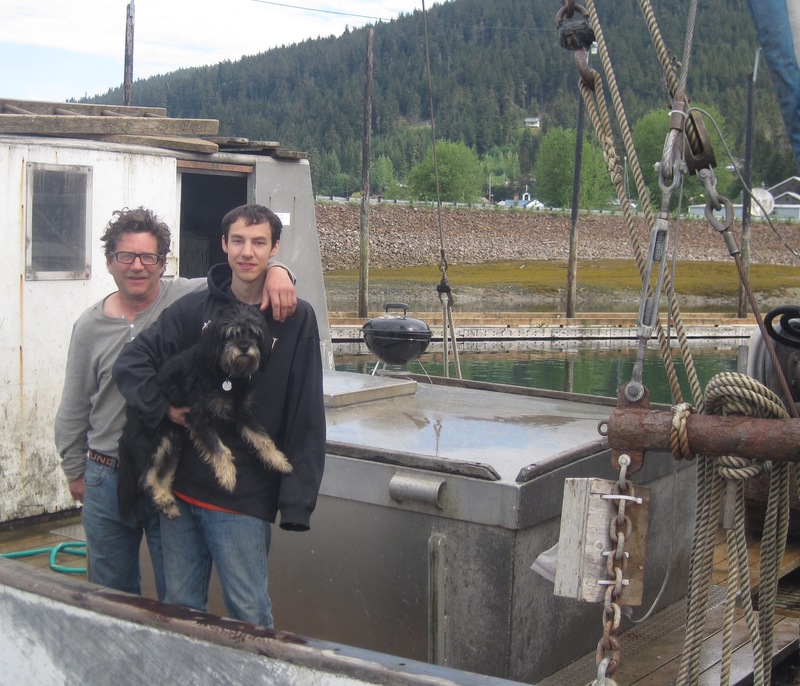 Nevertheless, the really big news was that Henry was once again joining us for a couple of months and together we decided to sail north into Alaska. It was a lovely reunion there in Port Edward and everyone else made him welcome too. But first, before Alaska, we went searching for grizzly bears in the Kutzenmateen national park… a remote mountain wilderness which we could easily access from the sea onboard Sänna. Grizzlies catching huge amounts of salmon. It was marvellous! 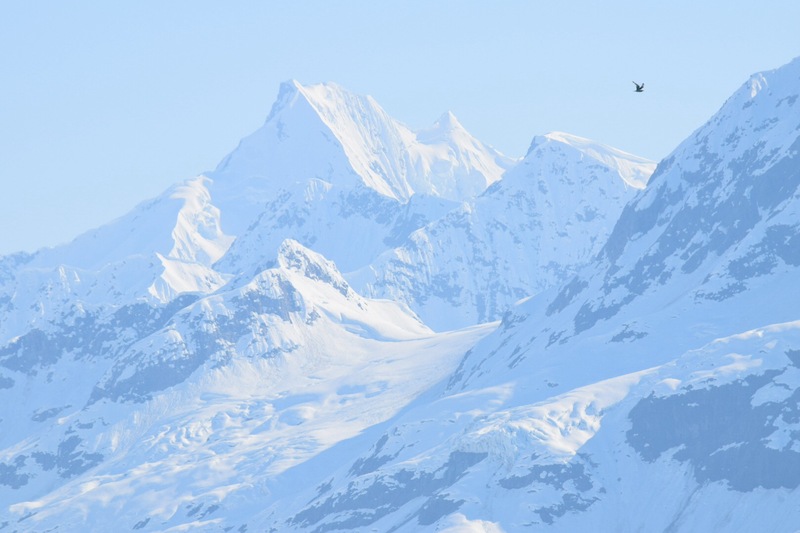 What can we say about Alaska? We have to say we didn’t get off to a good start; we yet again had immigration problems, this time in Ketchikan, where we were informed our six months entry allowance into the US had begun in Hawaii and now included our three week ocean crossing (in international waters and despite fully checking out through Hawaiian US Customs & immigration)… and would also include our one month in Canadian British Columbia. WHAT? We eventually got things resolved and, truth be told, we found Alaskan US immigration officials friendly and eager to help. Much friendlier than their counterparts and our so called Commonwealth brethren down in Prince Rupert. But the other huge shock was the immense cruise ships docked in Ketchikan… five of them disgorging thousands of not very adventurous tourists, who simply swamped the facilities and the town. Our own plan was to sail north through the famed Inside Passage, seeing Alaska in its tremendous glory but we were to be dogged by these cruise ships wherever we ventured. Sure, Wrangell and Petersburg were good because they didn’t allow the cruise ships in, but in all other places we found they simply took over. The real mind blowing problems were in Juneau and, by far the worst… Skagway. But we worked hard and we found real gems. 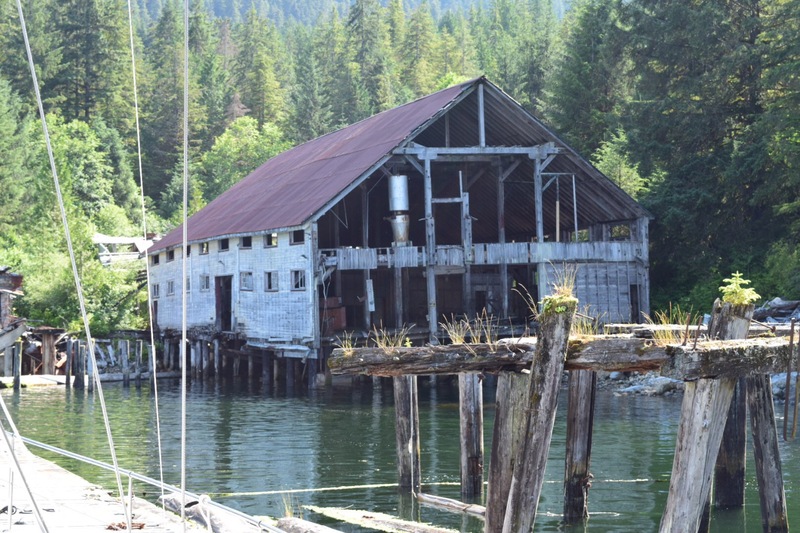 We sailed into Seymour Inlet, totally alone, and made our way to the Ranger station bear sanctuary located there. Whilst making our way we were, unbelievably, surrounded by literally hundreds of breaching humpback whales. But when we arrived at the sanctuary, a six hour journey one way, we were informed that visitor numbers were restricted by needing to apply for permits and the cruise-ship agencies had invariably booked all daily permits months in advance – and then they were flying tourists in by floatplane! But, do you know what? It all worked out. Whilst sitting on anchor waiting to leave the next morning, a family of grizzly bears appeared on the beach only a few metres away and we had the perfect standpoint for over two hours… with no one else around at all. We didn’t need to pay anyone anything nor need their permission. From Seymour Inlet we headed north to Auke Bay in Juneau because we’d begun to experience problems with our Volvo Penta engine. Whilst waiting for Jim Betts Marine to sort something we decided to make a three day trek inland to the Eagle Creek glacier, to stay in a remote cabin located there. We equipped ourselves with trekking gear… rucksacks, sleeping bags, cooking stoves and boots from a local store, packed three days food supplies and set off. What followed was one of the hardest trail experiences either of us had ever experienced despite considering ourselves experts; although Henry was in his element. It was amazing… once we arrived. We slept in the cabin, found freshwater from a creek, cooked over an open fire and kept an eager eye out for the numerous bears that frequented the area. There were fresh bear signs all around us. When we eventually made our way outbound along the trail we found our route blocked by a large black bear, who insisted on finishing berries from a bush before allowing us to pass. It was an amazing although worrying experience. Once back in Auke Bay it seemed Sänna’s engine was going to be a cause for further concern and various parts were going to have to be shipped way down south to Seattle to be rebuilt. Bugger! Juneau and Alaska weren’t a good place to experience these issues although we’ve got rather used to sorting problems in remote locations. It goes with the adventure unfortunately. 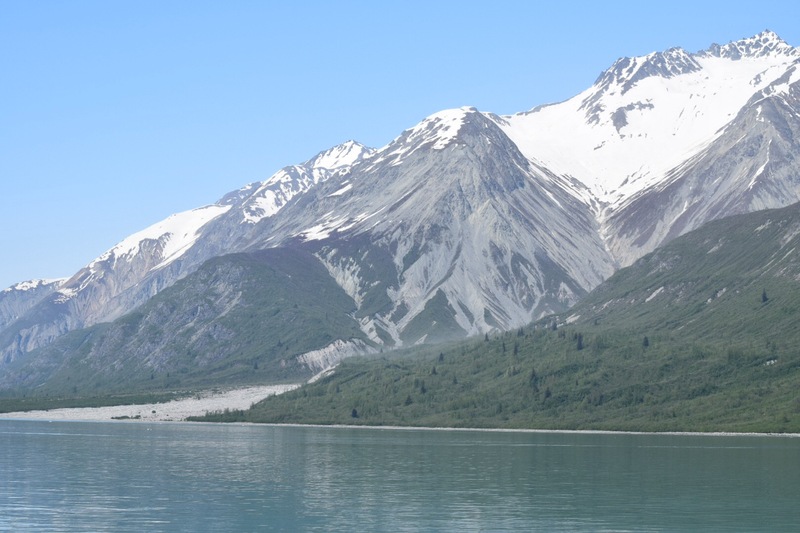 Not to waste time, we arranged to fly north to the despicably disappointing Skagway and from there take the incredibly scenic railway connection north to Canada’s stunning Yukon Territory. Following the original Klondyke Gold Rush trail, we made our way to Whitehorse and enjoyed the much different wilderness environment of the Yukon. But, we have to tell you, the four seater flight north from Juneau to Skagway, over the Alaskan mountains and glaciers, with Henry in the co-pilots seat, was easily our Alaskan highlight to date. 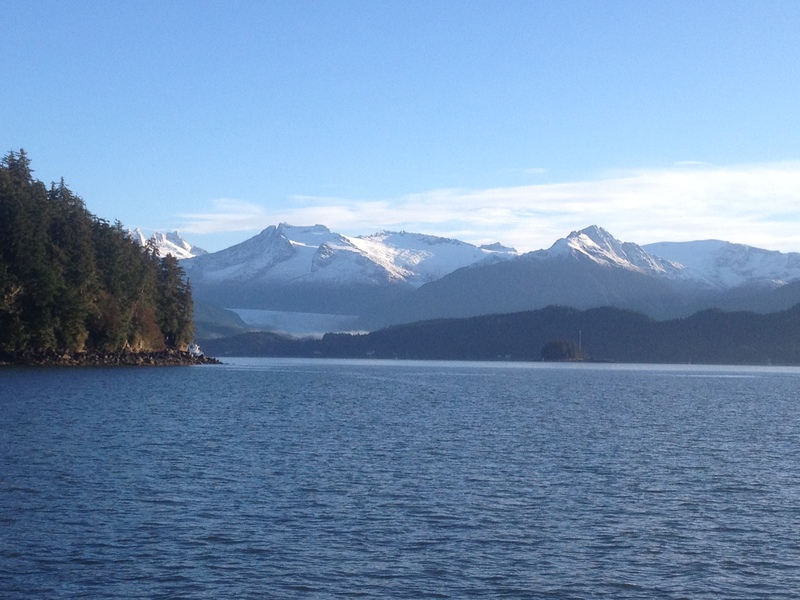 But then came Hoonah… and our somewhat disappointing opinions about Alaska changed. Of course, we needed to find a location where we could haul Sänna out of the water for the Alaskan winter. There was no way she could stay frozen in the water and we had long preparations to make for freezing temperatures and copious amounts of snow. 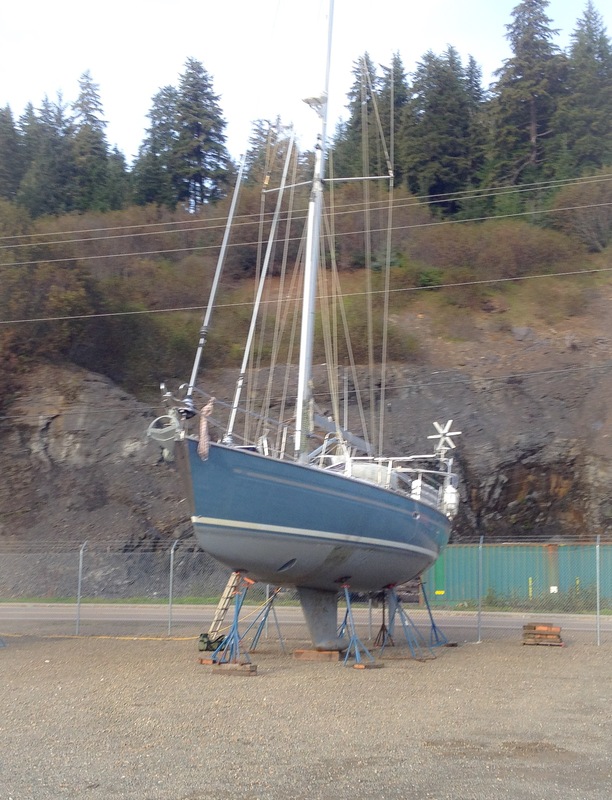 A German friend, Horst, onboard his sail-boat Awanesa, who we also knew from Hawaii, had earlier passed through Hoonah and found there a small First Nation community who’d used oil investment funds to build a small boat yard. And in that remote boatyard was a three hundred ton travel hoist to haul boats out of the water. Let us tell you that a hoist of this size in such a location is almost unbelievable! 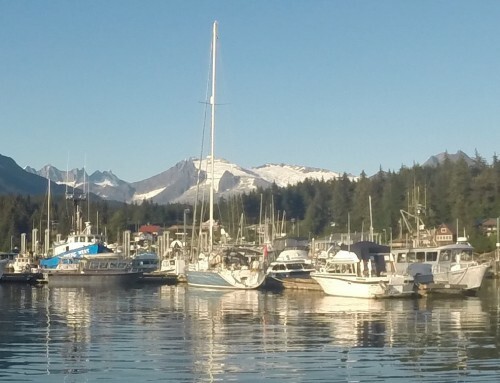 And Hoonah itself, close to the Alaskan jewel of Glacier Bay, is far off the tourist trail and represents true Alaska. We made our arrangements with Sherry, the harbourmaster here, to overstay for the winter… we hauled and we’ve begun to make friends. Good friends too. Friends who’d replace lost friends left behind in Hawaii, and those in New Zealand, Darwin, and Borneo. The friends too in the Philippines, Malaysia and Sri Lanka. And the now long forgotten friends in Yemen and Oman even. Eventually, just like Hawaii and everywhere else, Hoonah has become difficult to leave.